Pipette.com carries the complete line of Labnet Centrifuges including the Minicentrifuges, Micro & Refrigerated centrifuges and Small Laboratory centrifuges. We also carry rotors and accessories for the Prism, Minifuge and Spectrafuge brand names. The Labnet High-Performance Centrifuges C0336 & C0336R are capable of high-speed operation, expanding their use to applications in molecular biology and basic research. 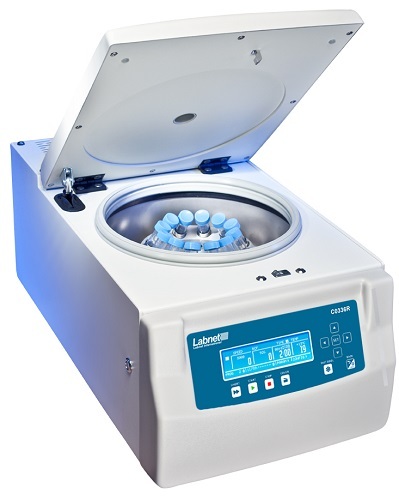 The Labnet High Performance Centrifuges C0336 & C0336R have a capacity of up to 400 mL with a swing-out and fixed angle rotor options available. The Labnet High Performance Centrifuges C0336 & C0336R are capable of saving 100 programs in the memory system. These Labnet High Performance Centrifuges C0336 & C0336R have a large LCD display that shows both pre-selected and actual run parameters with 10 different acceleration and deceleration levels. 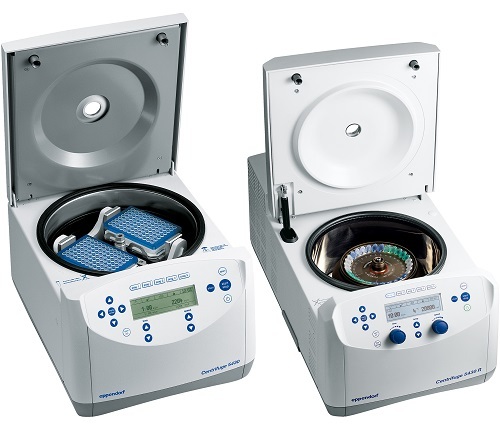 Both Labnet High Performance Centrifuges C0336 & C0336R are equipped with automatic lid opening and automatic rotor recognition for ease of use. The speed is set and displayed in either rpm or RCF in the Labnet High Performance Centrifuges C0336 & C0336R. Safety features incorporated into the centrifuges include start blocking when the lid is open, lid locking during rotor running and imbalance sensors. The unit runs on a maintenance-free induction motor and it has continuous and short time operation modes. The centrifuges allow the programming of multi-segment acceleration and deceleration characteristics with password protection. Labnet Mini Microcentrifuges (C1601) are the new line of mini microcentrifuges from Labnet International. Labnet Mini Microcentrifuges (C1601) are personal benchtop microcentrifuges that are ideal for quick spin downs of your most important samples. 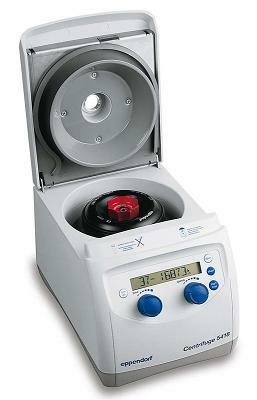 The new Labnet Mini Microcentrifuges (C1601) will replace the previous Spectrafuge Mini Centrifuges. Labnet Mini Microcentrifuges (C1601) are simple and convenient to operate. 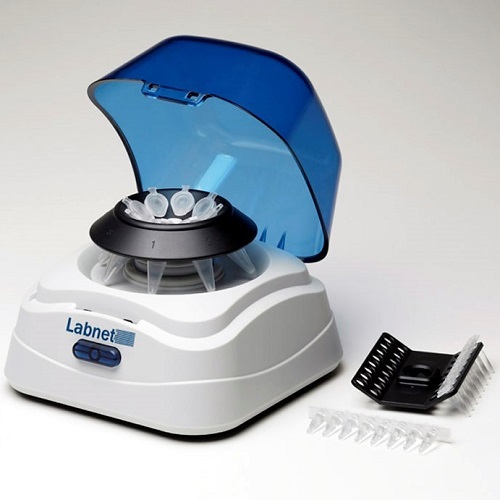 The new Labnet Mini Microcentrifuges (C1601) feature a greater capacity (8 place MCT and 4 place PCR strip rotors), as well as a quick-release rotor system and electronic brake. Once samples are loaded and the lid is closed, the rotor rapidly accelerates up to a maximum speed of 6,000 rpm, making it an ideal microcentrifuge for bringing small droplets to the bottom of tubes for micro-filtration or basic separation applications. The quick release rotor system of the Labnet Mini Microcentrifuges (C1601) means that no tools are needed to exchange rotors, saving you valuable time in the lab. The electronic braking system allows for more rapid deceleration and less waiting time once your spin protocol is complete. The mini microcentrifuge is also equipped with a dual lid switch and has a compact yet ruggedly durable design. These new mini microcentrifuges come with a 2-year warranty, providing you with added peace of mind in the quality of your purchase.